The taste of Drambuie is the result of infusing a unique blend of aged Scotch whisky with a secret combination of spices, heather honey & herbs. Its origins can be traced to a secret recipe created for Bonnie Prince Charlie by his Royal Apothecary in the 18th Century. The elixir was infused with spices such as cloves for their medicinal purposes, and saffron to give the liquid its rich golden colour. It became the Prince’s personal draft, and he drank a few drops each day for strength and vitality. A unique Highland spirit - it is most certainly royal in appearance, exquisite in taste and deliciously potent. The name Drambuie is derived from Scots Gaelic An Dram Buidheach and means "The Drink that Satisfies". One of the best liqueurs there is. Helps if you like whisky flavours though. Mix it in equal measures with blended scotch whisky to produce a Rusty Nail - one of the best cocktails there is. And no ice! If one were to drink Drambuie straight at room temperature, it undoubtedly tastes sweet. But that is telling the story in one dimension. With the simple addition of ice, the drink is transformed into an altogether richer experience. Ice releases the constituent parts to reveal smoky whisky, liquorice and honey with an undertone of herbs. 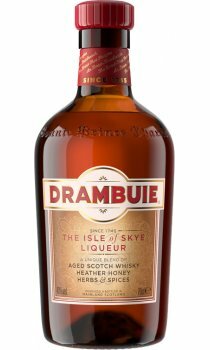 Drambuie is also an ingredient in many cocktails including the classic Rusty Nail - two parts (preferably good quality malt) whisky, one part Drambuie, poured over plenty of ice; add a twist of lemon peel rubbed round the rim of the glass and then added to the drink as garnish. Perfect! To be honest, I thought it was sickeningly sweet. It's impossible to identify the separate ingredients, it's so incredibly sweet. Shame, really. I wonderful drink. A true taste of Scotland. Try pouring a little over a good quality vanilla ice cream with a little sprinkle of freshly gound black pepper. Yum!